GATHER SOME THINGS TO SHARE. We do not take reservations. Tables are on a first come, first served basis. Animales Barbeque Co. is now serving up food in our taproom Thur through Sun - Roll thru and check out our FOOD page for more deets! You can purchase growlers and 750ml bottles to-go from our taproom any day we are open, until 10PM. After 10PM you must leave with your growler, per Minnesota State Law. We will fill other breweries' growlers as long as they are clean. Please just holler at us if you'd like to visit our taproom with groups of 40 people or more. We wanna make sure our staff is ready for ya. Please email info@ablebeer.com with the date and approximate time so we can be awesome to you. Welcome! 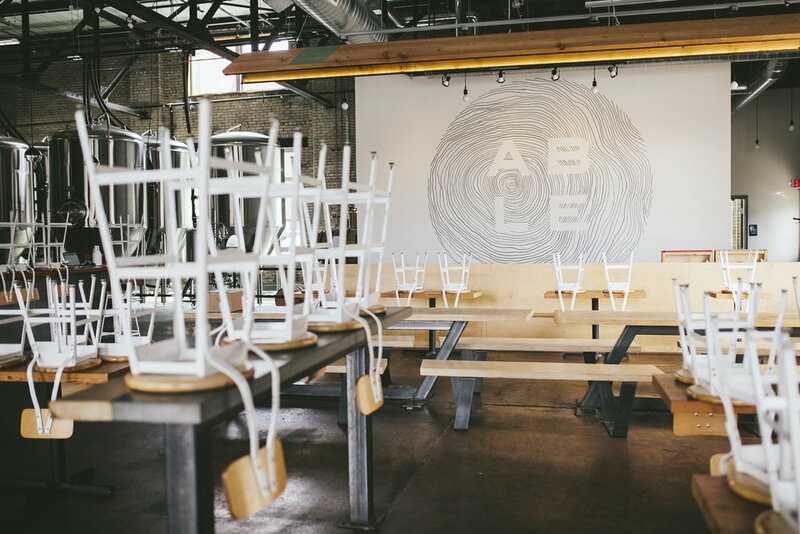 Able is kid friendly. We usually have games for the kids. They just need to leave by 9PM per Minnesota State Law. Bring 'em in! Your furbabies are welcome as long as they are well-behaved and on a non-retractable leash. WANT ABLE ALL TO YOURSELF? Our taproom is available for private events on Monday and Tuesday evenings. If you are interested in more information, please email events@ablebeer.com.